To my surprise, the shuttle appeared very close to the Vehicle Assembly Building from my viewing location just south of Titusville. As a breaking-news reporter, I have a responsibility to remain available in case a story breaks. Photographing space shuttle Atlantis' final (barring backroom deals) launch Friday was bound to get me caught in traffic and cause me to be late for work. So, for the 2:20 p.m. liftoff time, my objective was to find a headache-free place to watch the launch without getting stuck in traffic after. The place I found proved to be that and then some. I've had my eye on this secluded spot for several months, since I rode my Harley down a dead-end road along the Indian River south of Titusville. My first thought was that the area would be perfect for a night launch: There would be no artificial lights to mess up a timed exposure. Just me, the trees and the water. And the shuttle, of course. The road is a dead end because beyond it is the barricaded property of the Astronaut Hall of Fame at the foot of the NASA Causeway, which leads to Kennedy Space Center. Despite that, beyond the closed-off portion, there are dirt trails in the woods that meander along the shoreline. Occasionally, there are clearings, and I chose one of them Friday afternoon as a place to watch this historic launch. There were only a few other vehicles: no problem parking. And only a half dozen or so people had gathered near me. Many of them were either current or former military members, so it was good company. We sat coolly in the shade and watched the fish jump for flies and the pelicans dive for fish. We kept the conversation light, especially when NASA developed a problem with a ball bearing, threatening to scrub the launch. Fortunately, that didn't happen. 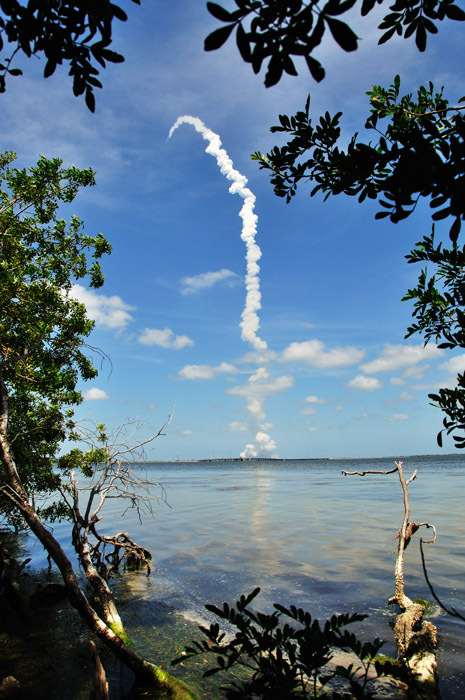 Over a 25-yard span of the shoreline, I scouted out three stations from which to take photos during the launch. First, I'd go for a telephoto shot from an unobstructed piece of shoreline. Second, I'd capture some wider shots of the shore, a tree and maybe a spectator in the foreground. And for the third shot, with an old 2-by-8 I found lying around, I built a makeshift bridge to a log about 5 feet from the shore. On this "bridge," I'd get a photo of the arcing contrail framed by the vegetation surrounding me. 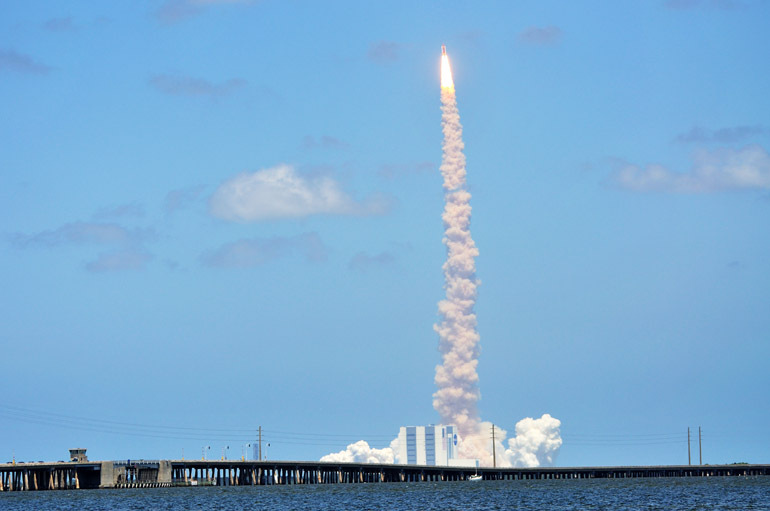 The biggest surprise was when the shuttle lifted off. Not that it was any different from usual launches, but I just had never photographed the thing from this angle south of the launch pad. 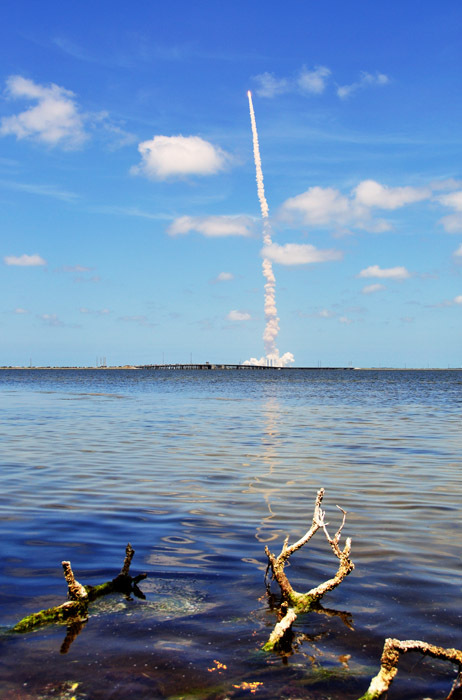 I thought it would appear over the horizon far to the left of NASA's Vehicle Assembly Building. Instead, it climbed skyward just to the right of the tallest one-story building in the world. An unexpected bonus for this photo op. But it also gave me an idea for the next launch. Oh, and I didn't struggle with traffic in the least on the way into the office on U.S. 1, or Route 1, as they call it in the state of Maine. I'm not sure of the reason, but hundreds of cars were stuck on NASA Causeway, heading away from the space center, when the launch took place. 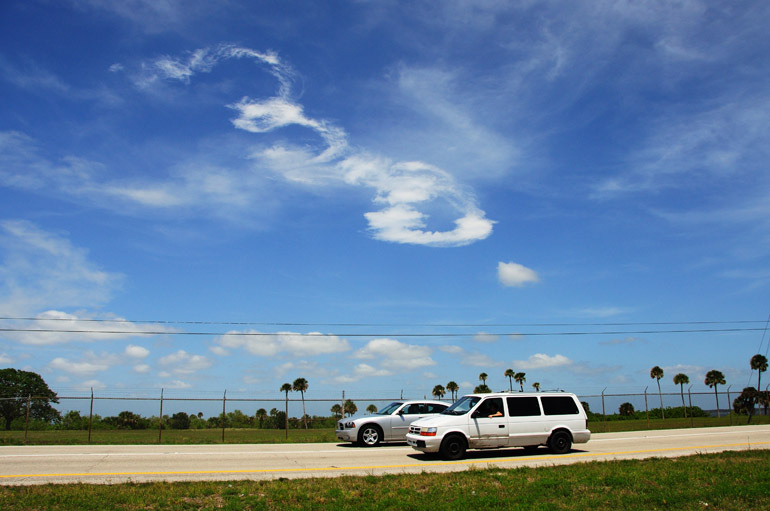 My best guess is that they were turned away from entering the Kennedy Space Center Visitor Complex. 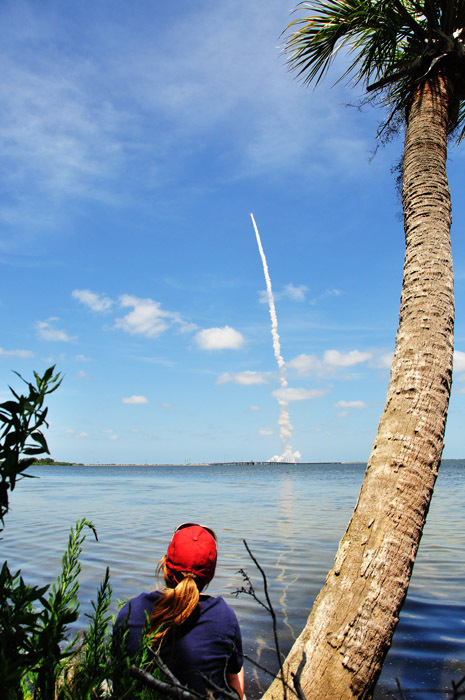 Even though the location offers only an obstructed view of the launch, such attractions are increasingly popular now that there are just a few shuttle launches remaining. And the Space Coast is milking it for all it's worth. 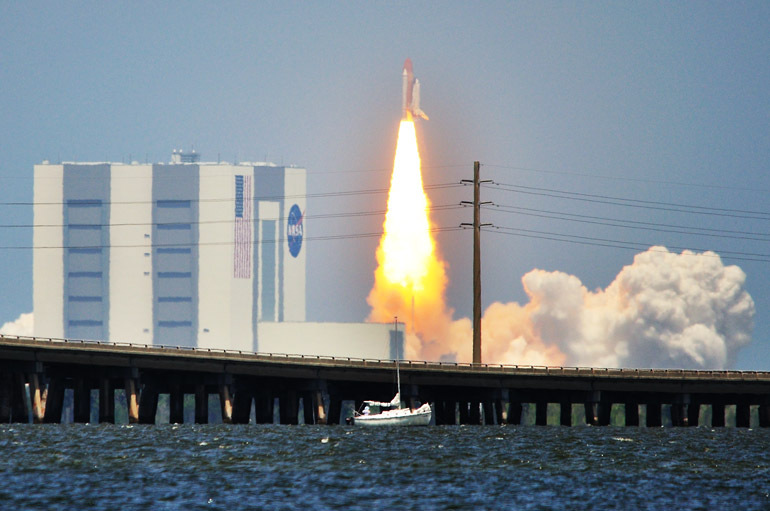 My newspaper co-workers enjoyed these shots with the VAB and a boat in the foreground. They certainly were views I myself had not before seen. So it's nice that they decided to print a large version of the one at the top of this post. Maybe next time I'll wear hip waders so I can get right out there into the water. This woman, who's in the Navy, sat on the base of this palm trunk and videotaped the launch. She was one of the few other spectators. The photography editor at the paper called this an "Ansel Adams" launch shot, a true compliment. I briefly thought about converting it to black and white, too. This is the location where I had to make a bridge -- leading onto the log you see on the right-hand side -- to achieve this framing effect. Before stepping into my car for the rather painless trip into the office, I took a close-up of the remaining contrails. 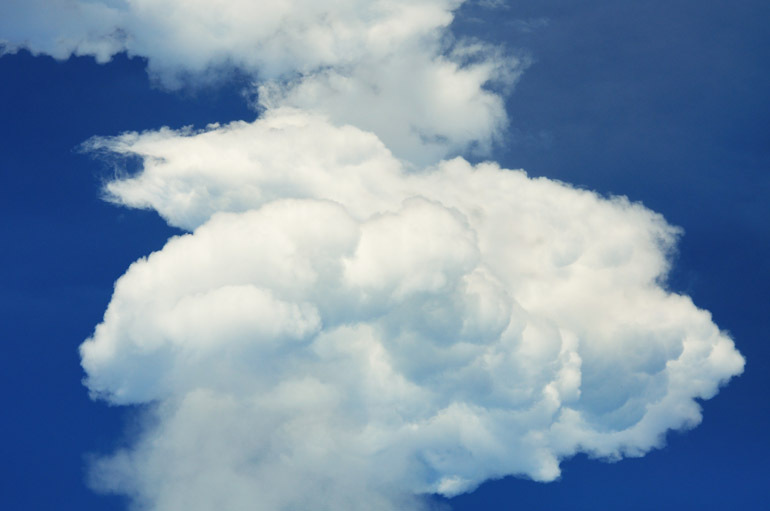 They tend to take on a very textured look, similar to storm clouds. The contrails get a little wispier here, forming a familiar corkscrew pattern that often happens after a launch. The wind was blowing briskly inland, so that likely contributed to this formation. I took this shot from my car while waiting at a stoplight near Port St. John.